As much as I LOVE Repli-Kating, sometimes items are still a bit out of my price range. That’s when I like to get creative and Copy-Kate! A “Copy Kate” is a term I use when I find a style or print that Kate has worn as clothing and it appears on something other than the original outfit This allows me to diversify my wardrobe and accessories, but still keep the classically Kate style that we all love. This past holiday weekend (for those of us stateside) I went shopping, because it’s my birthday week and I wanted to treat myself!! 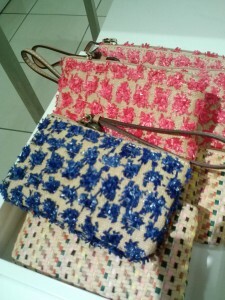 I ended up finding these cute wristlets (the Pom Pom mini pouch) from Ann Taylor Loft and it reminded me instantly of the LK Bennett Lasa Poppy Print dress that The Duchess wore on her Australian tour. Available in both a hot pink and deep blue, this was a perfect Copy-Kate find in my book. Another one of my all-time favorite Copy-Kate’s in my wardrobe is my leopard print scarf. When Kate first appeared in Leopard print at the christening of the new Princess Liner Cruise Ship, I knew I wanted to incorporate it into my style/wardrobe. I’ve always been cautious with prints and patterns, I have always felt that animal patterns were out of my comfort zone. To make a nice comprise, I made a scarf (super easy, by the way! If you request! 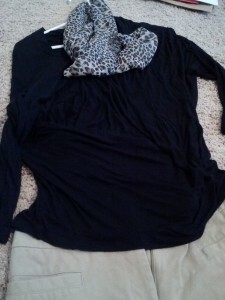 Im sure to share ;)) out of some leopard print material and paired it with a solid black top. Classically Kate with my own unique twist. A popular summer trend and one that we saw Kate demonstrate Down Under, is the eyelet pattern. I love the eyelet because its whimsical and romantic but not too formal. A recent Copy-Kate that I located were white eyelet shorts at Banana Republic Factory Outlet stores. Kate seems to LOVE wrap dresses. And what’s not to love about them. They make any body type very flattering and you can dress it up or wear it down. I have a few myself but sometimes I want to branch out. Faux wrap tops are a perfect way to capture Kate’s style and diversify your wardrobe. I found some wrap tops from Macy’s neutral colors that I believe would be Kate approved for a classic Kate look with a little twist. What are some of your favorite Copy-Kate’s? Do you have any ‘White Whales’ that you never bought and wish you had? Would you prefer we post the newest Copy-Kate finds? This entry was posted in Shopping Smart and tagged Anne Klein, Banana Republic, Copy-Kate, Duchess of Cambridge, Kate Middleton, Pom Pom Wristlet, Repli-Kate, Vince Camuto. ← Laura Marie’s Bridal Shower and Wedding Fun! Great post! I both copy-kate and repli-kate. As Elizabeth mentioned above, it’s nice being able to have your own style shine through, especially if some outfits don’t suit your tastes. My favourite copy-kates have been dresses with sleeves and the right proportions (especially length – I find many dresses come up to mid-thigh which makes me look squat, and are very uncomfortable! ), which are surprisingly difficult to find. The Hobbs Wessex dress (and the Dorothy Perkins copy-kate) is definitely my white whale.